Reigning Swedish champions Ostersunds FK head into the 2022 Allsvenskan season expected to retain their title. Norrkoping, 2nd place last year, are expected to challenge Ostersund but ultimately finish in 2nd. Will the one-time Swedish champions be able to hold off the inevitable charge of Norrkoping? In this part of our story with Oscar Friberg, we review his sixth season as manager of Ostersund. We’ll see how his side played in the Europa League knockout rounds, we will review the Swedish Cup and see if they could finally lift their cup curse and win at the fourth attempt and finally we’ll find out if Ostersund could retain their title. 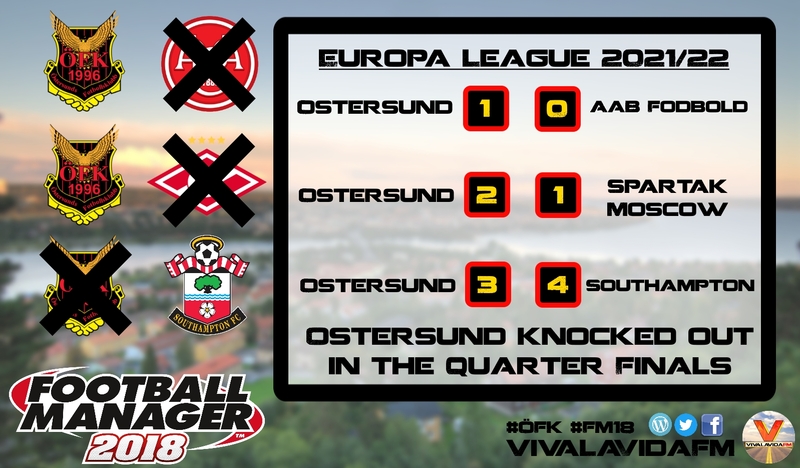 Ostersund reached the knockout rounds of the Europa League for the first time under Friberg’s management. They were met in the 1st knockout round by Danish side AaB Fodbold, who gave them two closely contested matches before falling 1-0 on aggregate. In the second knockout round Ostersund were drawn to play Russian giants Spartak Moscow. We played brilliantly away from home and took back to Sweden a 1-0 win. In the second leg we fought hard but were trailing 1-0 after 90 minutes – this meant we would have to play extra time. It all looked set to go to penalties before a 122nd-minute goal from Japanese sensation Ken Sasaki secured our progression through to the Quarter Finals of the Europa League. Fouad Bachirou, a veteran now in our side, played a delightful little through ball to allow Sasaki to squeeze in a beautifully finished goal. In the QF we met Southampton. We lost the first leg 2-1 away in England, but the away goal gave us hope in the second leg. Unfortunately Southampton netted an early goal to cancel out our away goal. We did fight back as Cameroonian Mbarga scored a quick brace but James Ward-Prowse scored the final goal of the game to knock Ostersund out of the Europa League. Two years in a row we have reached the final of the Swedish Cup and fallen at the final hurdle. 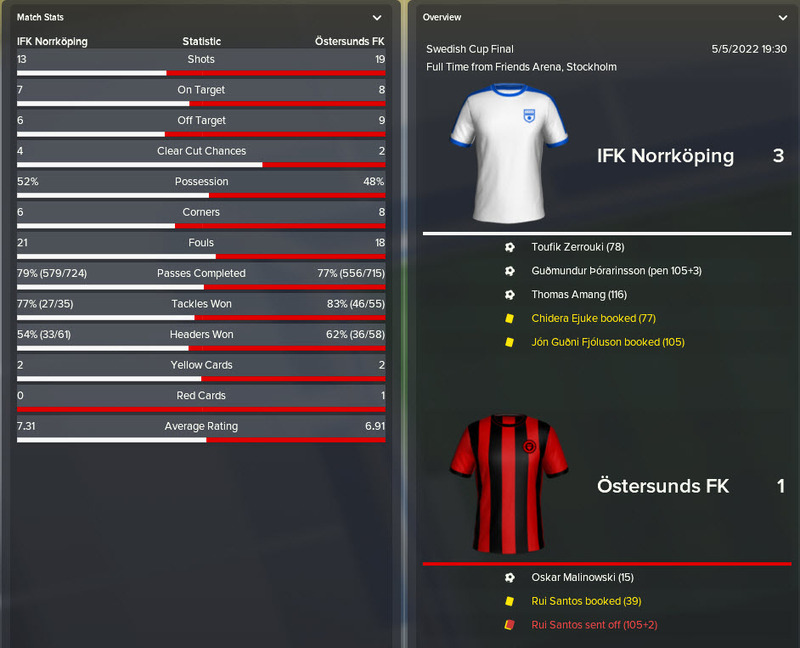 Both times we fell to a strong Norrkoping side who have won the Cup for 3 consecutive years. This year, frustratingly for Friberg and co, was no different. This year we took the match to extra time, but Rui Santos, our star defender, brought down an opposition player to not only give away a penalty but to also receive his marching orders. We lost the match 3-1 and again finished as runners-up in the Swedish Cup. Swedish Allsvenskan 2022 | Can we defend our title? 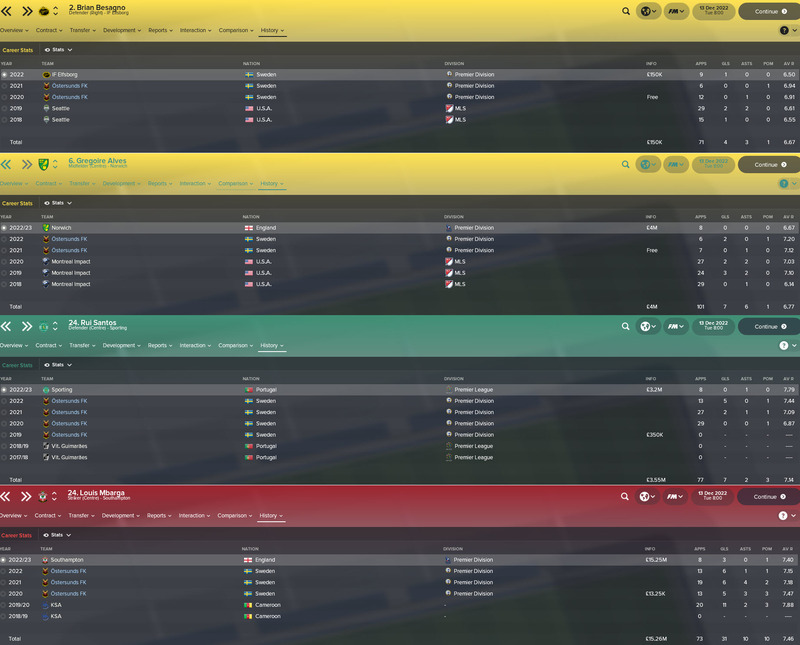 We started the 2022 Swedish season off poorly, winning just two of our opening 6 matches. 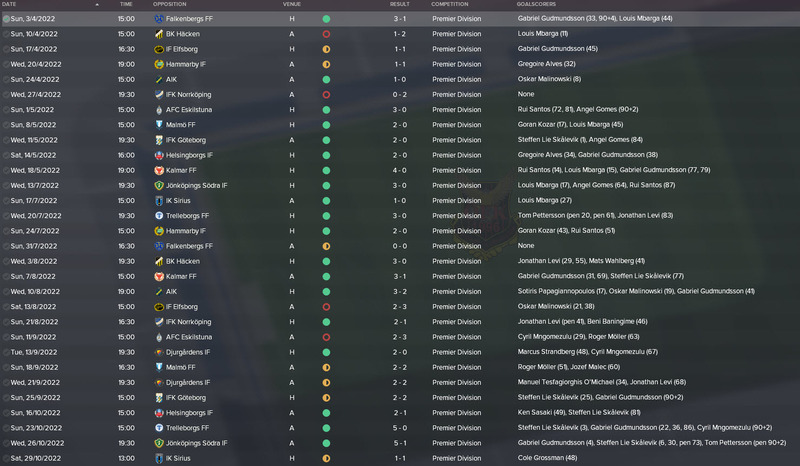 After losing to Norrkoping (and subsequently losing the Swedish Cup final to them) we went on an amazing run which was defined by our superb defensive performances. This run included 11 straight clean sheets in the league and culminated with us leading the way at the top of the league. But then came the summer transfer window, and herein lies the excuse I’ll be using should we not retain our title. Rui Santos, shown in the image above, has been sold to Sporting in Portugal. He was, without doubt, our best central defender and his influence was certainly missed. You can see from the image below just how crucial he was to our team and how difficult it was to adapt to life without him. The red line indicates when the board sold Santos without allowing me to protest it. Santos wasn’t the only player who left our club in the summer. We chose to sell Cameroonian wonderkid Louis Mbarga (our first official wonderkid of the save) to our Europa League conquerors Southampton for a brilliant fee of £15.25M (rising to £23.5M with add-ons). This transfer further highlights the excellent progress we have made in the transfer market. Here are just four players who we brought in for cheap and sold for decent profit. Mbarga is the obvious highlight but Canadian Gregoire Alves also departed our club this season for £4M to Premier League side Norwich. We brought him in for a free and he played 13 league matches for us. Top class business indeed. Back to the Allsvenskan now. Ostersund and Norrkoping fought for the title all the way through the season. Ostersund were in the ascendancy throughout the clean sheet run but a series of poor defensive performances following Santos’ departure saw them slip to second in the league. And despite a turnaround in defence as our newer players began to adapt to their role, we failed to retain the Swedish title. Norrkoping regain the Swedish Allsvenskan title as Ostersund finish as runners-up. As you may well have noticed, our Champions League playoff came just at the wrong time. We were drawn against Norwegian side Rosenborg and had we played the tie five games earlier I’m sure we would have progressed easily. But it came in the middle of our defensive crisis after losing Santos and we lost the first leg 5-2 at home. The tie was over before we travelled to Norway. This did mean that we would go straight into the Europa League group stage and thankfully these matches came as we began to find our defensive form. For the second season running we topped our group, albeit with two fewer points in comparison to last year. This sees us progress to the knockouts once more where we’ll face Ukrainian side Dynamo Kyiv. I have deliberately excluded the statistics for Oscar Friberg’s international role with Sweden. I’ll be reviewing how Friberg is doing with Sweden in my next post (this will include the 2022 World Cup). Friberg has an impressive win percentage in all three of the competitions he has managed regularly in. A 78.1% win ratio in the Swedish Cup would look so much better had we won the last three finals instead of losing them, but all-in-all we must be happy with our progress. This save is still proving to be one of my most enjoyable ever on FM. I do hope you are enjoying the journey with me. Thank you very much for reading another instalment of our Football Manager 2018 story here on VivaLaVidaFM. 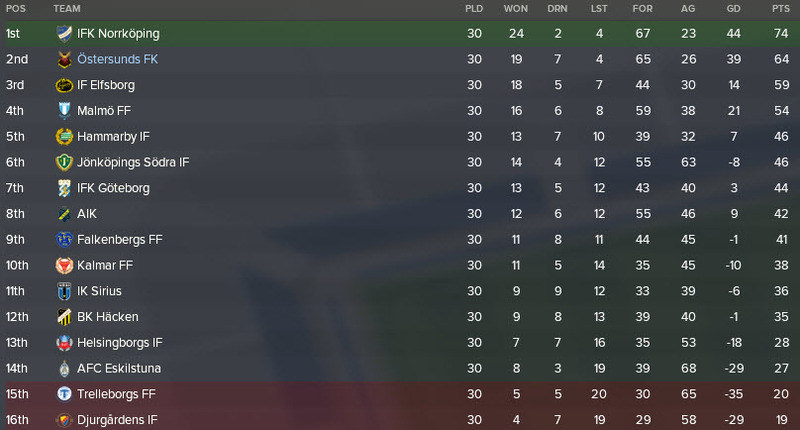 Although our season six didn’t go as we would have hoped, we still qualify for next years Champions League. Let’s hope we can perform better in it next year! This entry was posted in FM18 Stories, Football Manager 2018, Oscar Friberg, Ostersunds FK | @VivaLaVidaFM and tagged champions league, europa league, europe, fm stories, fm18, football manager, norrkoping, ostersund, sweden, swedish allsvenskan, swedish cup. Bookmark the permalink.